Technologies developed in orbit can be of use to companies on the ground. This week in Houston, the Spacecom meeting will nurture that exchange. 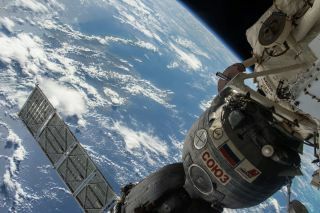 Pictured here, the Soyuz TMA-17M spacecraft is seen docked to the International Space Station. Leaders and innovators of the commercial space industry will descend on Houston this week for a meeting aimed at demonstrating how technologies developed in space can help build business on Earth. The first annual Space Commerce Conference and Exposition (SpaceCom) will "showcase the real, viable links between space technology and Houston's major industries," according to a statement released by the event organizers. The five industries targeted by the conference organizers are advanced manufacturing, communications, energy, medical and transportation. In addition, the conference also aims to assist space tech companies in growing their business opportunities in space and on the ground. The conference, which will run from Nov. 17 to 19, will feature presentations, an exhibition hall and networking opportunities for attendees. NASA Administrator Charles Bolden will deliver the opening keynote address on Tuesday (Nov. 17), and is expected to speak about NASA's role in the growing commercialization of space. Other leaders from NASA will speak during the three-day conference, including Ellen Ochoa, director of NASA's Johnson Space Center. Former astronaut and chief test pilot for XCOR Rick Searfoss will deliver "an overview of the challenges, progress and opportunities across the 'new space' arena," according to the meeting website. Leaders of major commercial space tech and spaceflight companies will also speak, including George Whitesides, CEO of Virgin Galactic, and Jeff Greason, chief technology officer and chairman of XCOR. Both Virgin Galactic and XCOR are currently building commercial space planes, among other ventures. SpaceCom will feature many speakers not typically found at space-related conferences, such as Yuri Sebregts, executive vice president of innovation and research and development, and chief technology officer for Royal Dutch Shell (the international parent company of Shell Oil Co.). According to the conference website, Sebregts will speak about the way the energy company seeks to find ways to use new technologies that are "already proven," including space technologies. "SpaceCom is designed to educate business leaders on tested space technologies and how to apply them to solve real-life business challenges, dramatically impacting a company's profitability," James Causey, executive director of SpaceCom, said in the statement. "Many companies are already learning about, and adopting, these technologies in areas such as remote medicine, water purification, oil and gas exploration in harsh environments, complex communications systems, and weather data reporting."